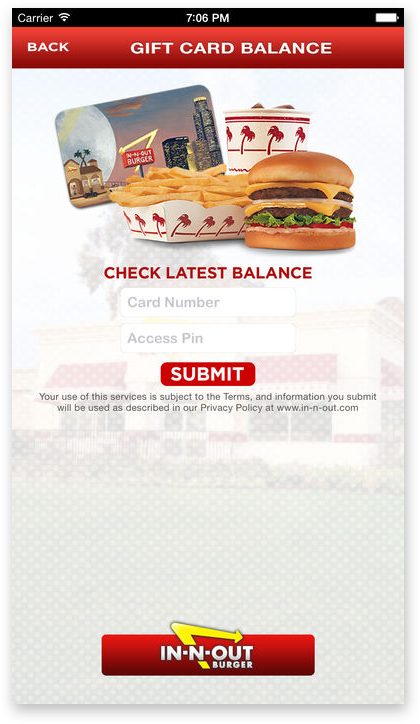 The current In N Out App was last updated in December of 2014, where it was optimized for iOS 6. Its average rating is 3 stars and it has been reviewed over a thousand times. This quick app redesign was a side project I worked on in the span of 4 days in order to better learn the prototyping software Sketch. In the current app, a user's main use for the app would be to view franchise locations, see the menu, and check their gift card balance. With apps out there like Apple and Google Maps, a location finding feature is almost completely irrelevant, and frankly a bit of a hassle when one could use another map app to both check the location and direct themselves there. And with a general google search and apps like Postmates, an In N Out menu is easily available (including their secret menu items, which aren't listed on the app). After assessing the app's outdated design, I took to the App Store to check out their reviews. Most of them revolved around not being able to pre-order and pre-pay for their meals. When I found that the pre-order and pre-pay option was the most sought after, I decided to have that be the main feature of my redesign. The Homepage focuses mainly on food, which seemed appropriate based on the contents of the app. My idea for the rotating carousel above was to feature current events, heartwarming stories of various In N Out locations, and submissions of food - this idea revolved around fostering a sense of community between the company and its customers. The Build Your Burger page is supposed to be a fun and interactive way to construct your perfectly personalized order. Here a user can click on each food icon to add or remove it form their burger. Every burger starts out as the original order, and users can edit from there. Lastly, to keep some familiarity with the older app, I kept the Locations feature, but included phone numbers and distance in miles. My idea upon selecting one of those locations is for it to have reviews listed (perhaps embedded from another application), complete with photos and stories about the real people who work at that location. To explore even further, I decided to test out my skills with motion design. I used Principle in order to derive motion from my once static graphics. These were simple transition animations for switching pages within the app. Create motion and interactivity by showing how a user would be able to customize their order by clicking on its content icons. Delving into the Secret Menu (as shown with the key icon on the homepage). Do these need to be unlocked somehow? Or are they just given to you.